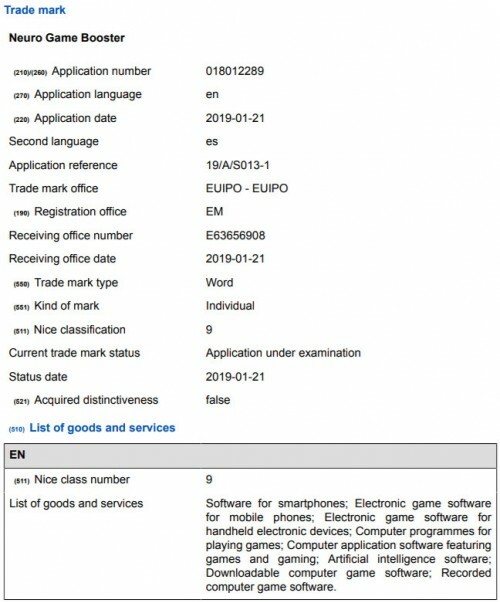 Software for smartphones; Electronic game software for mobile phones; Electronic game software for handheld electronic devices; Computer programmes for playing games; Computer application software featuring games and gaming; Artificial intelligence software; Downloadable computer game software; Recorded computer game software. The AI-aided software will optimize the performance of the GPU for smooth gameplay experience and will probably benefit from Samsung’s new NPUs on the Exynos 9820. We hope to hear more about it during the announcement of the new Galaxy S10 trio on February 20.